October 2013 Turkey Shoot Winners! Join us Friday, March 28th, 2014 for the final installment of our annual MMSF Turkey Shoot league. 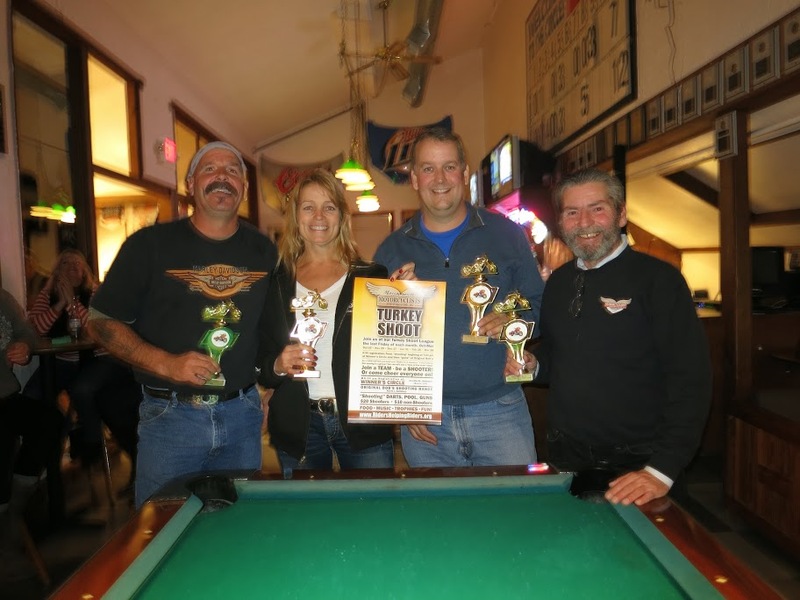 Each event is a ‘triathlon’ of Darts, Pool & Pistols, and will be held at The Winner’s Circle (211 Elm Street, Salisbury) and Air Soft Special Ops (124 Lafayette Road, Salisbury). Pistol shooting is now on BIG SCREEN video with automatic scoring machine at Air Soft Special Ops. Registration starts at 6:30pm at The Winner’s Circle, and the “shooting” begins at 7:00pm. Bring your friends as a team of four, come on your own to join a ‘luck of the draw’ team, or just cheer on your favorite team! Food, Music, Trophies, Camaraderie, Fun…where everyone SCORES! Tickets for shooters cost $20. Tickets for non-shooters (spectators) cost $10. Join The Survivors Fund and Check Twice Events for Check Twice Night at Fenway Park. All details and your tickets are here.